Interested in working with me? Read more about what some of my other clients have said about my yoga and sound healing services. Kerri is one of the finest yoga instructors I’ve ever met. She brings a unique blend of enthusiasm, energy, and fresh ideas to her sessions. Kerri tailors her classes to the needs of the participants as she displays an intuitive nature and knows how to “read” her audience. Her classes are innovative and exhilarating yet calming as she brings forth the the latest techniques and ideas that encompass all aspects of yoga. One of Kerri’s special talents is showing us how to incorporate yoga into our everyday lives. She inspires us to explore our mind, body, and spirit connection. Kerri is the best yoga teacher – her class is fun and interesting and most important (for me) is that I feel stronger after each class. Kerri has helped me to start a yoga practice after spine surgery. She has designed a program to work with my strong points, strengthen my weaknesses and make it fun. Kerri reawakened my love for yoga practice, which had been dormant since my second child was born. Her style is fun, not traditional, incorporates lots of props, as well as a good dose of meditative practice like affirmations and chanting. And G-d bless her, she always rewards hard work with blissful restorative poses. Kerri’s enthusiasm about her own evolving practice and sharing her discoveries with her students is absolutely contagious from the start. It is no surprise that she has developed a cult following in Montclair – I count myself among them! I started attending class with Kerri when I was 3 months pregnant. Coming from an advanced yoga practice, I was looking for a more intense prenatal yoga class than I was finding with other teachers. Kerri’s approach, based on the idea that in pregnancy a woman is stronger than she will ever need to be otherwise, was perfect for me. She allowed me to continue to practice yoga at my own pace and at my own level while being mindful of the safety precautions one must take during pregnancy. I practiced with Kerri through the very last moment of my pregnancy (my last prenatal class with her was 18 hours before my son was born). But even more important to me are the relationships I built in that prenatal community, relationships I have still with a great group of moms, and of course with Kerri (whose postnatal yoga is also no joke). I would recommend Kerri’s classes to anyone looking to advance their practice with a thoughtful and intuitive teacher, whether you are pregnant, post-pregnancy, or never planning to be either! Kerri’s joy and enthusiasm for Yoga shine through in every class. Even the more difficult poses seem to be more fun and effortless when she’s teaching. Kerri’s practice has helped transform my life spiritually, physically and emotionally. 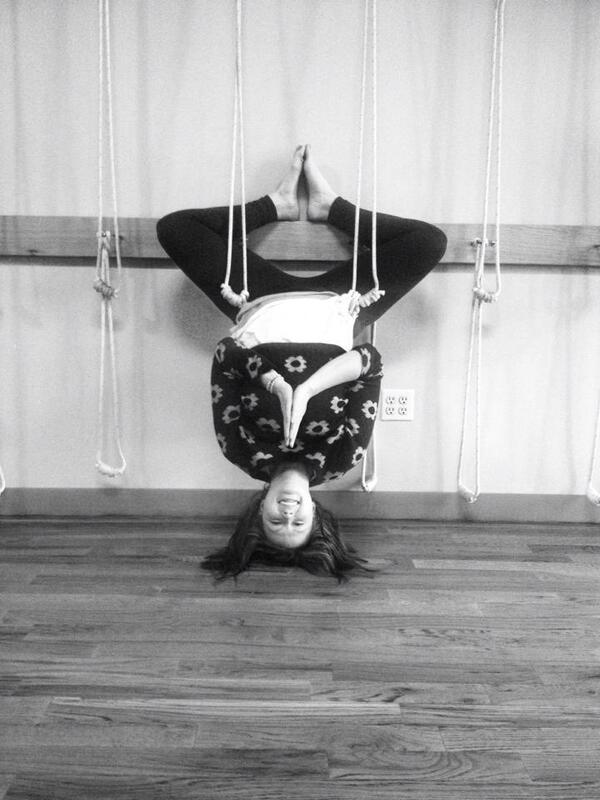 I’ve been in and out of yoga throughout the years but recently rediscovered this part of me. Thanks to this lovely and sweet and inspiring person, I have rediscovered my spirituality and learn more and more as I go along my path. As I deepen my practice, my dharma is being fulfilled by personal growth and Kerri’s teachings in and out of the rooms. I am very grateful to have met such a beautiful soul like Kerri. Namaste. Kerri, I continue to find your classes challenging and entertaining. I never know what you’re going to do or what you’ll talk about – but it’s always interesting. Your compassion and skill are always evident in how you work with us. Kerri is truly an inspirational teacher. She is warm, supportive and encouraging. Her technique is truly unique as it is both challenging and relaxing. She takes the time to incorporate thought provoking “word of the week” into our practice and offers us what we need, not what we want. She is a teacher that you would follow studio to studio. I look forward to my practice with her each week. Generous special spirit. Classes are uplifting and peacefully insightful both spiritually and physically. My grandchildren are very drawn to Kerri’s energy. Kerri received her 300 hour certification through Lotus Yoga Montclair in 2009. She fell in love with the spiritual path of yoga that has opened her heart, mind, and spirit.